Permit To Hunt And Kill One Black Rhino Sold For $350,000 : The Two-Way Namibian officials issue five permits per year to hunt the endangered animal. For the first time, one was auctioned off outside that country. Proceeds will go toward conservation of the herd. But critics say it's not right to kill one animal in a bid to save others. 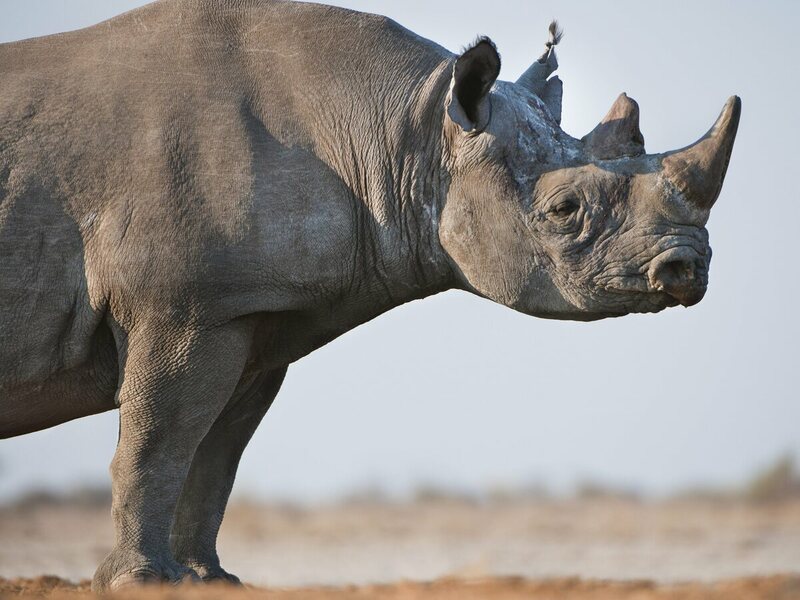 A black rhino in Namibia's Etosha National Park. The Dallas Safari Club's controversial auction of a permit to hunt one black rhino in Namibia raised $350,000 over the weekend, the club confirms on its Facebook page. That's at the lower end of the range that club executive Ben Carter had expected. In December, he told NPR that he hoped the auction would raise $225,000 to $1 million. As Weekend Edition Sunday reported, the club says that 100 percent of the money it has raised will go toward protecting the endangered animals. There are only an estimated 4,000 to 5,000 black rhinos living in the wild. Namibian authorities issue five kill permits per year. "The one auctioned Saturday was the first to be made available for purchase outside of Namibia," says The Dallas Morning News. Killing one older male rhino who's no longer able to breed, the club says, will benefit the rest of the herd. That's because older males often remain territorial and sometimes kill younger male rhinos. Others disagree. "Several dozen people protested the weekend auction at the Safari Club's annual convention in downtown Dallas, which ended Sunday," the Morning News writes. "The Humane Society and the International Fund for Animal Welfare were among the groups that spoke out against the hunt." "As an older male myself, I must say that this seems like a rather harsh way of dealing with senior citizens. ... Surely, it is presumptuous to assume that this rhino's life is no longer of any value. ... True conservationists are those who pay money to keep rhinos alive—in the form of highly lucrative eco-tourism—as opposed to those who pay money for the cheap thrill of taking this magnificent animal's life and putting his head on a wall." "Hanns-Louis Lamprecht of Hungers Namibia Safaris was among the vendors and exhibitors at the convention. The Namibian man said he saw an auction attendee decline to bid when his daughter called telling him not to because of all the negative publicity.
" 'It annoys me to tears,' Lamprecht said Sunday. 'I was so angry last night. A million dollars would have lasted years, years in the conservation efforts. ... The fact is it could have been more — it could have been a lot more.' "
The club did not identify the permit's buyer.